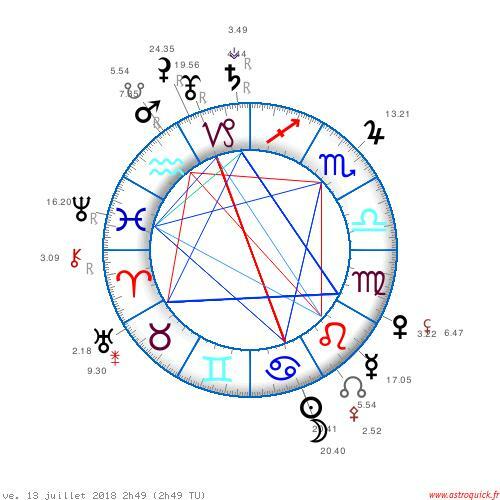 As we talked about in the previous article related to Uranus entering Taurus, we are going to hear much about The Mars Uranus square as it will repeat itself several times during the summer due to the retrograde effect of the two planets. It will be exact on August 2nd and September 19th. Apart from these two dates it won’t be so strong even though we will be able to feel it, just like right now (mid-June) with tensions, disappointments, blocks or sudden change of course as the planets in Capricorn (Saturn and Pluto) resist to Uranus in Taurus’ need to innovate. 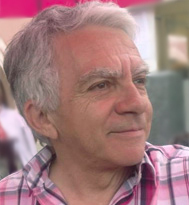 Many people are impacted by these tensions: they feel fatigue and stress. 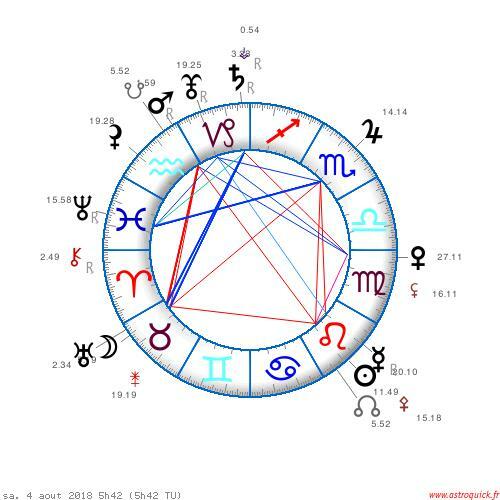 I am especially talking about first decan fixed signs: Taurus, Aquarius, Leo and Scorpio as emphasized per the New Moon chart of June 13th. 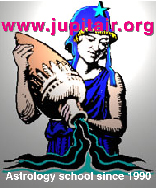 Not only Mars in Aquarius was disharmonic Uranus, but it is also opposed to Venus Sesqui-square the luminaries. 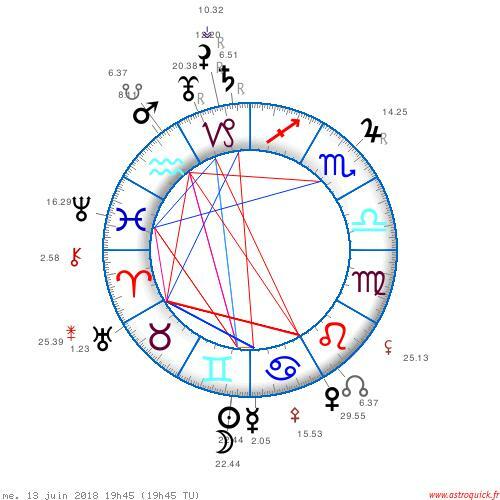 On top of that, the New Moon happened while Square to Neptune in Pisces, which adds confusion and doubts. But trust me, it won’t last since the Mars Uranus Square gets looser starting on June 19th, which will allow the fix sign to relax a bit. As you can see on the July 13th chart, things are getting smoother even if the Square is coming together again in retrograde motion. We can see the Grand Trine in Earth signs with Uranus, Saturn and Venus, which helps realize projects, stabilize finances and consolidate what you already have. 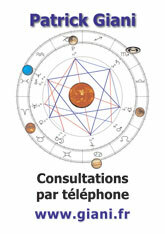 This is especially favorable to Earth signs: Taurus, Virgo and Capricorn. Although, end of July could very well be more agitated with the red planet coming close to Earth. 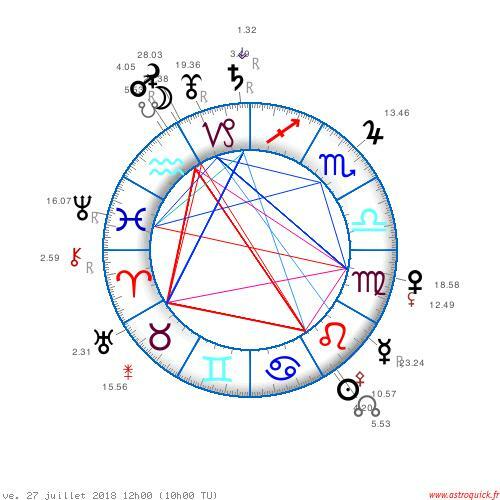 This is confirmed by August 4th: day where the Mars-Uranus Square is exact, just like the day of the May 15th New Moon. More tensions and challenges are on the way for first decan fixed signs: Aquarius, Leo and Scorpio, except this time for Taurus which benefit from a Trine to Saturn which will help them ground their new life’s chapter and relax a bit. 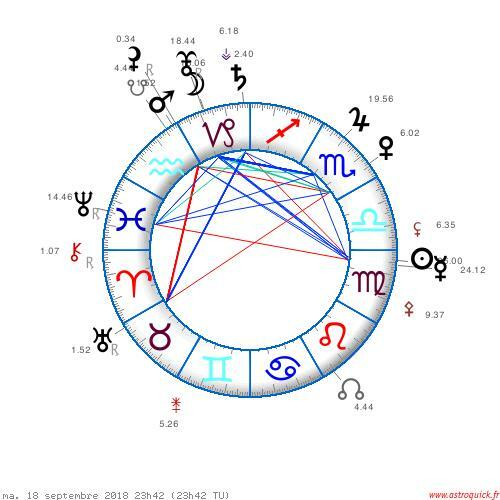 September 18th is the last Mars-Uranus Square, impacting the 1st decan fixed signs as Venus in Scorpio will challenge Mars in Aquarius’ initiatives (lack of money and/or love) but it will only last a few days. Finally, by October 7th, the square loosens up for good, allowing the necessary adjustments since Uranus comes back in Aries until its definitive return in Taurus… on March 2019. How to transcend the Mars Uranus Square? We can see that Uranus entering in Taurus is connected with the start of the volcanic eruption in Hawaii and Guatemala (the volcano of fire) and to the violent storms and lightning’s all around France beginning of June. 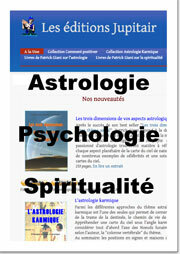 This is all about Uranus’ power, and it is not over! It is therefore necessary to adapt to novelty and surprises brought by this planet, which is a great time to develop flexibility, patience and… sense of humor. Uranus is the one that invites us to not take ourselves too seriously, live in the present moment (present is a gift) and welcome what Life has to offer gracefully. The Summer solstice will be favorable for consciousnesses adjustment, especially for those who are already awakened. A nice acceleration is expected in the Ascension process during this portal, which will benefit to fixed signs surroundings (resolution of conflicts) and will give them a chance to take care of themselves!